Health information exchange (HIE) is turning out to be one of those really long journeys in which you hear the kids in the back seat asking, "Are we there yet?" while the driver keeps saying, "Almost." The Office of the National Coordinator is focusing on the next 10 years with its soon-to-be-released road map to reach interoperability. As we await the March 2015 release, it is a good time to reflect on the 10 years since I pulled onto the HIE highway and share a few thoughts on the future. When I joined the journey in 2004, the focus was on exchanging information between hospitals and other large providers. However, we soon realized the need for some to get their own house in order before they could exchange with other organizations. Many hospitals, clinics and private practitioners didn't have electronic health records, and others were looking at changing outdated systems and technology. The push soon became to implement EHRs, and this has consumed a great deal of resources over the last few years. Finally, we are seeing even the smallest solo practitioners and rural hospitals making the switch from paper to electronic records. As providers once again turn to connecting with their referral network care partners and those beyond, it is also important to continue the process of "getting our own house in order." This means connecting the remaining internal digital systems for the sake of increased efficiency, reduced risks and better outcomes. Providers have long struggled with the interoperability of internal systems and the flow of data and information between EHRs, PACS, behavioral health and other information systems. However, they don't always consider opportunities to leverage the information being gathered in devices and other equipment. As we look forward, there is a need to connect the multitude of digital devices — everything from hospital beds in the ICU that weigh patients to blood pressure cuffs in every patient room. The feed of this data into the patient's electronic record will help minimize transcription errors and improve documentation efficiency. Vendors will need to do their part to ensure that the data collected by their devices can flow seamlessly into a patient's digital health record. Population health, medical homes, pressure to control costs and healthcare professional limitations during an impending explosion of older and elderly adults requires more efficient and effective practices for exchanging information with patients. Providers have been rolling out their patient portals, but they aren't always designed in a way that makes it easy for patients to use, nor do they include the functionality that patients really want. The most effective healthcare leaders will expand features to improve health literacy and self-management — before, during and after care/treatment, so that patients and their providers will want to take full advantage of this resource. 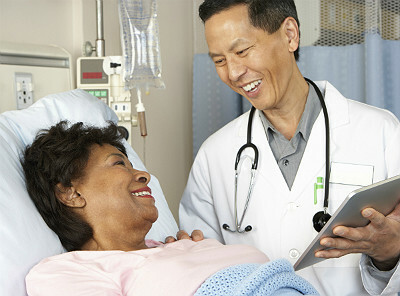 They will also demonstrate the value of secure messaging and assist hesitant clinicians in becoming active users. Yes, HIE within and across organizations has proven to be quite challenging and probably more difficult than anyone could have expected. Many of us knew it would be a struggle to get hospitals to trust each other and vendors to follow common standards. Then there was the challenge of getting physicians and other providers to purchase and implement electronic records in practices and clinics. While these challenges remain, there has been tremendous progress — even if it has been slow in coming. Change is hard, and making the right choices can take time. Over the next 10 years, healthcare leaders will need to maintain their focus and commitment to continually monitoring the HIE landscape and being prepared to implement the changes needed as the opportunities present themselves. So, while we may not be there yet with HIE, the driver's answer rings true: "Almost."